Day 1 Jaipur/Ranthambore National Park: Travel by road for approximately 4 hours to Ranthambore National Park. Formerly the hunting grounds of the Maharajas of Jaipur, today Ranthambore is a major wildlife attraction and particularly renowned for its tiger population. After settling in at your hotel depart for an afternoon game drive. 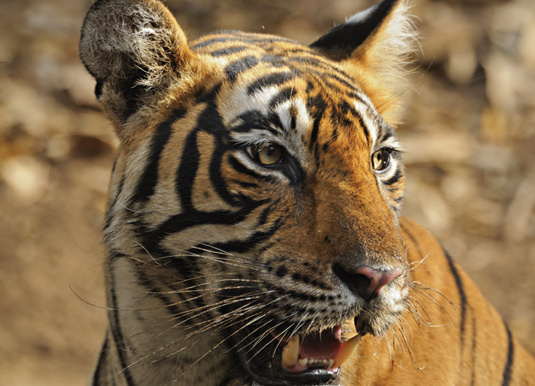 Day 2 Ranthambore National Park: Depart early this morning for your first game drive of the day. Famous for its diurnal tigers, Ranthambore is also is home to a huge variety of animals, birds and reptiles. Return to Dev Vilas for breakfast and time at leisure before another game drive in the afternoon. Day 3 Ranthambore National Park/Jaipur: A further chance to enjoy the wildlife with another early morning game drive. Return to the hotel for breakfast and later depart for Jaipur. Spread over three and a half picturesque acres Dev Vilas is a comfortable 19 room property with architecture following a traditional Indo-Saracenic design that echoes the hunting lodges built by the Maharajas. Enjoy pre-dinner drinks at Fateh’s Bar before dining on fine Indian or continental cuisine at the restaurant where al fresco dining is also available beside the pool. After a busy day in search of the celebrated tigers and other fascinating wildlife, the comfortable, individually decorated rooms provide a stylish abode to relax within and come complete with picture windows to savour the views of the surrounding Aravalli Hills. Departures: Daily from Jaipur. Excluding July-September when Ranthambore National Park is closed. Accommodation: In standard suites with have air-conditioning, bath and separate shower and mini bar. Tour price: The price shown is based on the best value travel dates in low season and includes return private transfers from Jaipur to Dev Vilas, 2 nights accommodation and three shared game drives.